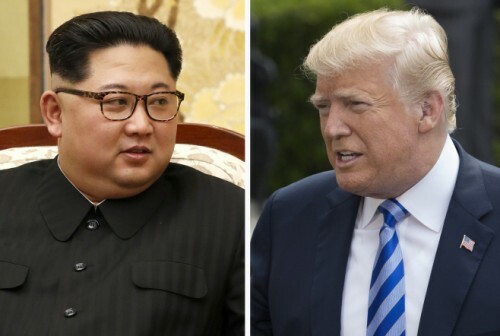 North Korea has abruptly cancelled high-level talks with South Korea scheduled for Wednesday and has also threatened to do the same with a planned summit with the United States, undermining the peaceful atmosphere in the region. For now, North Korea is not likely to spoil the mood of dialogue itself. However, it seemingly intends to get more from the United States by threatening to walk out if it doesn't get its way. The North's move signals a tense war of nerves in the future negotiations with the United States. "We are no longer interested in a negotiation that force our unilateral nuclear abandonment, and this would force us to reconsider whether we would accept the North Korea-US summit," North Korea's first vice minister of foreign affairs Kim Kye-Gwan said in a statement carried by the North's official Korean Central News Agency on Wednesday. "If the Trump administration comes to the talks with sincerity for improved relations, it will receive a deserved response from us," he added. The vice foreign minister made it clear that the purpose of the talks is to urge change of US attitudes. The most urgent thing for North Korea is the US' guarantee of Kim Jong-un regime's survival. Analysts say that North Korea has expressed its strong discomfort plainly as the US has only mentioned about offering economic aid in return for North Korean denuclearization while not mentioning regime safety. There are also observations that North Korea was forced to raise the stakes at this point. Despite a flurry surprising moves from the North in recent weeks, including the release of the American detainees and the shutdown of its Punggye-ri nuclear test site, the United States and South Korea conducted joint military exercises, codenamed Max Thunder, and stressed to offer economic rewards instead of regime guarantee. Many believe that the North's abrupt cancellation of high-level talks with South Korea citing the Max Thunder drill is its strategy intended to take the initiative in negotiations with the United States. In addition, North Korea is seemingly trying to prevent US comments in advance on issues that are not related to denuclearization, such as human rights, biological and chemical weapons, and abductions of Japanese citizens. South Korea and the United States, surprised and perplexed over North Korea's unpredicted move, are keeping an eye on the situation while trying to analyze North Korea's exact intentions. The South Korean government described Pyongyang's move as "regrettable" and urged Pyongyang to swiftly return to the talks. The Unites States has made it clear that it will prepare the North-US summit while not making any official response to the North's' announcement. China asserted that the United States should act with good will and sincerity while saying South Korea should respect North Korea's reasonable concerns.